During the past year I have spent a lot of time studying and thinking about the issues of energy, climate change, environmental issues in general (soil degradation, deforestation, ocean acidification, loss of biodiversity, etc. etc. ), and the prospects of industrial civilization. I am now familiar with the ideas of a number of influential thinkers and have solidified my own views on the subject. In this essay I'll discuss energy descent visionaries -- people who have recognized underlying trends much earlier than the general populace -- different typical responses to these realities, and the types of changes that are likely to take place in society, from a socionics perspective. It is very likely that peak world oil production (so-called Peak Oil) occurred in July 2008 at 74.82 million barrels/day, when prices also reached a historical peak of $145 a barrel. This probably triggered the world financial crisis. From now on production will fall because the remaining oil is increasingly costly to extract, and the economy flounders when oil prices rise above a certain level, since oil consumption is an integral part of every significant production process. There are 4 basic lines of thinking on what will happen next, among those who are aware that something significant has happened. These were described by David Holmgren and are portrayed in the following graph. 1. 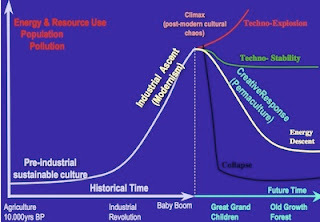 "Techno-Explosion" - Human inventiveness, technological progress, and the invisible hand of the market will ensure us continued progress, economic growth, and new sources of cheap energy. 2. "Green-Tech Stability" - We may experience a small drop in economic output as we transition to a more sustainable economic model where alternative sources of energy come to replace fossil fuels and ultimately allow us to continue our modern lifestyle and current level of societal and technological complexity. 3. "Creative Descent" - As the economics of production and distribution fundamentally change, incremental decisions will be made at the individual level, resulting in a gradual retrofitting of much of our existing infrastructure for useful purposes in a new, increasingly sustainable society with ever less energy at its disposal. 4. "Collapse" - The end of economic growth will trigger financial collapse, followed by economic collapse, political collapse, and the disintegration of society. It seems that one's views on this subject tend to be heavily influenced by 1) one's position in society and 2) one's temperamental disposition (personality). Views #1 and #2 are prevalent among those who control capital. After all, scenarios #3 and #4 leave little role for big capital. The vested interests of those who have political power and financial capital predispose them to see the future as either scenario #1 (Libertarians and Republicans) or #2 (Democrats and Independents). Even if these people have personal doubts about the possibility of these scenarios, their practical interests lead them to publicly promote one or the other. Vast disinformation campaigns are funded by groups with vested interests in scenario #1 to discredit destabilizing information such as climate change research, Peak Oil, and the environmental movement. The mainstream environmental movement is also well-funded and generally fights scenario #1 and promotes #2, while making use of science that actually suggests #3 or #4. Almost no one is interested in funding campaigns related to #3 and #4 (for the reason stated above), so they stay out of the mass media, out of the public eye, and out of political debate. People who are at the fringes of society and are part of various subcultures may be predisposed to views #3 and #4. They have already internally rejected mass culture and lifestyle in some way or another, and so it is hardly a leap for them to suppose that the powers-that-be will not be in power for long, and that people with lifestyles and views more like their own will prevail. In general, people tend to paint a picture of the future where people like themselves are more successful than average. From a type perspective, it seems to me from my limited observations that types with may tend to support scenario #1 or #2, possibly because it is often hard for them to imagine a life much different from what they have now, their active nature often puts them in a position of material influence where they derive gain from the status quo, and because they tend to be somewhat more territorial about their current position and possessions. Types with tend to place a lot of stock in technological progress and can't imagine that people would choose to give up technological advancements. They tend to be experts about one or two things related to energy and technology and are absorbed by the trends in those areas alone. I find a lot of people with views #1 or #2 among them. Types with tend to see situations holistically (and often, but not always, superficially), change their expectations of the future quickly, and are less psychologically attached to the current socioeconomic system. Therefore, upon learning some facts about the situation, they easily jump to view #3 or #4. If optimism dominates melancholy in their temperament, then #3. Types with seem to naturally be aware of problems; telling them that things may get worse is hardly news. Many seem predisposed to think that everything is going down the tubes and that nothing can be done about it (view #4). However, some have a strong contrarian streak that leads them to debunk whatever views they perceive to be dominant. Types with tend to feel at the sidelines of society more often than those with . Criticism of modern civilization among these types is common, since industrial society devalues their natural strengths in many ways. These types seem predisposed to views #2 and #3, but not to the extreme pessimism of #4, which requires a great degree of imagination. I have nothing to say at the moment about other socionics functions and how they may predispose one to a particular view of the situation. Of course, it is not only one's personality that influences one's views, but also one's position in society (what, if anything, is at stake), as well as cultural factors that are perhaps too diverse to classify. As to be expected, when we talk of the trends of the future we find that more intuitive types have influential and well-articulated views on the topic. Take these typings, as always, with a grain of salt. Many of them are open to discussion. This is just a sampling of those who hold influential views and is not meant to be exhaustive. Representative videos are provided where possible. Joseph Tainter (ILI) authored an influential book, Collapse of Complex Societies, where he hypothesized that societies collapse when they obtain smaller and smaller benefits from additional investments in complexity. I would not categorize him as an activist of any kind, but rather a scholar and theorist on the subject of complexity and collapse. He focuses on history and economics much more than environmental issues. Jared Diamond (IEE), geographer and ecologist, authored the other well-known book on collapse, called Collapse: How Societies Choose to Fail or Succeed. Here he examines how societies respond to environmental problems that inevitably arise as a result of population growth and habitat exploitation. Diamond is outspoken on the environmental problems that modern society must solve over the next few decades in order to avoid collapse. His books and numerous public lectures have a human touch and tend to inspire activism. Ted Kaczynski (SLI), aka the "Unabomber," was a math whiz who severed his ties with modern industrial society to live a peaceful life in the Montana woods. When his peace was disturbed, he began a terrorist mail-bomb campaign against people who he felt represented the "Establishment." His manifesto, Industrial Society and Its Future, published in 1995, contains many psychological insights relating to industrial society's negative influence on the individual, but it shows a lack of awareness of numerous objective issues, notably the myriad environmental problems of our time, and Peak Oil. According to another viewpoint, Kaczynski could be a paranoid LSI who believed sweeping revolutionary change can be effected by attacking basically random people who are representative in some way or another of negative societal forces. Dmitry Orlov (ILI), a popular blogger and author, compares the collapse of the Soviet Union with the impending collapse of the U.S. He lays bare the foolishness of U.S. leadership and the folly of mankind in general. Richard Heinberg (IEE), ecologist and author, focuses on Peak Oil and how society must change to deal with it. He focuses on societal paradigms and adaptation to a post-Peak Oil future. His presentations have a human touch and suggest personal and community applications. Bill Mollison (ILE), naturalist and co-originator of the concept of permaculture. Developed a design system for land use that is fully sustainable and can improve degraded land in a matter of years. Spent years traveling around the world helping set up permaculture systems and spread knowledge. Permaculture is a whole new system of living, not just a new agriculture method. David Holmgren (LII), ecologist and co-originator (with Mollison) of the concept of permaculture. Geoff Lawton (IEE), prominent permaculture designer and consultant. Has a warmer and more personal touch than, say, Mollison, while at the same time seeming somewhat less scientific and more enthusiastic. Al Gore (LII), politician, businessman, and climate change educator. Gore's type may predispose him to scenario #3, but his financial and political interests probably influence his promotion of a scenario that looks more like #2. Bill Gates (LIE), business magnate and philanthropist, is wedded by wealth to scenarios #1 or #2. Any proposed solutions must therefore involve big business and centralized government. Furthermore, his personality leads him to focus on technology development and logistics, problems which seem entirely solvable. My personal views are along the lines of the permaculturalists -- a dominated field (even though it focuses heavily on food production!). In my opinion, these thinkers have best been able to lay bare and tie together all the different factors and problems facing society and propose a realistic solution. They seem to have the best scientific support (and little industry support). Scenario #3 seems the most realistic and, at the same time, is sufficiently positive to inspire individual action. Proponents of scenario #4 have less to offer and seem to have less understanding of agriculture and ecology. Scenario #1 is impossible; if it were possible, it would already be happening, because all the economic incentives are in favor of taking that direction. Scenario #2 is potentially inspiring, but naive. See, for instance, Richard Heinberg's detailed report on the limitations of all important forms of energy. It will quickly become apparent that there is no complete replacement for fossil fuels. Cheap energy and ease of transportation promotes the concentration of capital and the growth of centralized power. Using abstract socionics language, this favors over . As oil becomes scarce, some trends of the past few centuries will be reversed. Instead of being drawn into a complex economic system where each person has a narrow function and only 1 or 2% of people produce food, people will retreat from the global integrated economy and begin producing more and more of their own food. There is no way to avoid the re-localization of agriculture and economic decentralization in the U.S. and other countries. This will favor a value shift towards . Whether society takes a more "Alpha" or "Delta" direction is hard to say. If existing societal institutions are basically preserved, then we might have a Delta situation. If not, then probably Alpha. Those who stand to lose most from this turn of events are large corporate and power structures who run our lives today. If these power structures collapse, new ones will eventually appear (the blind spot of today's permaculturalists). Permaculture philosophy is terrific for establishing sustainable human activity, but it gives little attention to the possibility of nomad raiders and the eventual establishment of a feudal system of governance where individual farmers and tradesmen must pay tribute and suffer some degree of servitude. One possible way you could cover the Se blind spot would be to integrate the protection with people they are intended to protect. So for example making sure that your militia is made up of family members of the "farmers" (using general terms). And therefore making it difficult for the militia to go on a murderous rampage on its own people. Since killing your own family members is a tad more difficult than killing people you have no real knowledge of. If the area and the amount of people the militia protects become large to the point where you have a situations requires that you need multiple bases, you could mix recruits from different provinces. So as to make sure one military base doesn't go off track and attacks another or attacks the people they are not related/connect to. Another route you could go down would be indoctrinating the militia with the values of the people they are trying to protect. So making the militia pledge allegiance to a doctrine. Constantly reminding the militia members of "where they come from" (their relation to the farmers) and who they are trying to protect. Having members go through a selection process which essential makes sure they have the "correct values". Getting rid (demoting/not promoting/killing) militia members who express views which are vastly contrary to the values. Although all these methods might go against the core values of the permaculturalists so there might be some trouble in that area.